Nursing Home Abuse and Neglect: Illinois Nursing Home Attorney Mike Keating: Tort Reform Assocation names Cook County a "Judicial Hellhole"
Tort Reform Assocation names Cook County a "Judicial Hellhole"
Cook County, Illinois, with its reputation for hostility toward corporate defendants, has long been known as a receptive host for lawsuits. In past years, the Chicago area experienced a surge in asbestos claims, embraced class action lawsuits and became known for excessive awards. Cook County still hosts significantly more than its proportional share of lawsuits in the state, as its courts permit "forum shopping" whereby lawyers from other parts of the state or country can bring lawsuits that have little or no connection to Cook County. It was also a Cook County court that threw out a state law aimed at solving medical liability problems that had set physicians fleeing the state. At press time, the Illinois Supreme Court was still considering the appeal. The ATRA fails to note several key factors in its criticisms of Cook County. First, Cook County contains a massive number of people and businesses in a small area. These circumstances invariably lead to congestion that is inherent in all metro regions and contributes to the number of incidents that lead to law suit. Second, it has been my experience that if a Cook County judge can transfer a case out of the county, and therefore off of their docket, they'll do it. Cases stay in Cook County because they belong in Cook County. Third, the Cook County court that threw out the state law "aimed at solving medical liability problems" did so because similar laws had twice before been ruled unconstitutional. In other words, the judge was doing her job. 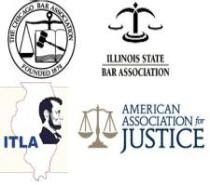 The ATRA also fails to mention that a number of studies found no correlation between the legal climate in Illinois and the cost of medical malpractice insurance. If the ATRA was honest, they would note that the leading medical malpractice insurers all could not show any correlation between their rates and payouts made to settle lawsuits.